O – M – G!! Bakery lovers… Pumpkin Donut Shop smelled positively yummo-rama!! You know what it reminds me of? Campfire Donut, another Bath & Body Works bakery scent I love. I reviewed Campfire Donut – link to review here. I almost want to say it’s the exact same scent except this candle has a tinge of pumpkin to it. And oddly on cold sniff, I don’t smell pumpkin at all. I just smell a deep-fried donut. Super deep fried. You can actually smell it. First sniff, I smell everything above except for the pumpkin spice. I don’t smell any spice in this candle. Just fluffy cake donut (deep fried) and vanilla glaze. That be it and let me tell you… it smells delicious! Loved! Now let’s see how this candle performs. I have high hopes and expectations. If it disappoints, I’m going to be very sad. I lit my Pumpkin Donut Shop candle in my master bedroom to start out and waited for the donut magic to begin. About a half an hour in, I was greeted to the light aroma of deep fried donuts. Key word – light. So, I immediately moved this candle to a smaller room and that’s where it stayed till the last drop of wax. My guest bedroom from then on out smelled like deep fried dough on steroids and it was yummy beyond words. Up close to the candle, I could smell the subtle pumpkin notes but once you move away from the candle, the pumpkin goes away. At least for me it did. Regardless of the lack of pumpkin spice, I loved the aroma. 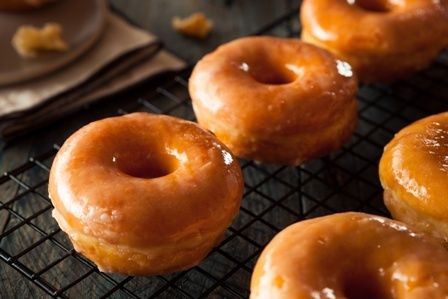 Deep fried donuts all the way and you could even smell the vanilla glaze. Mmm! Mmm!! Mmm!!!!!! Strength – This candle did disappoint in the strength department for me but I still liked it enough to purchase again. I’ll just burn it in a smaller room for the best scent throw. On a scale of 1 to 10, I would rate this candle as follows. 5 in a large room. 7 in a medium and 10 in a small. How did my Pumpkin Donut Shop candle burn? This candle struggled the top 1/4th of the wax – the wicks fizzled out and it almost looked like all three wicks would extinguish on their own causing the candle to tunnel. But, I stuck it out and the wicks did end up righting themselves (PHEW!) From then on out, the candle burned great, clean burning, no tunneling. 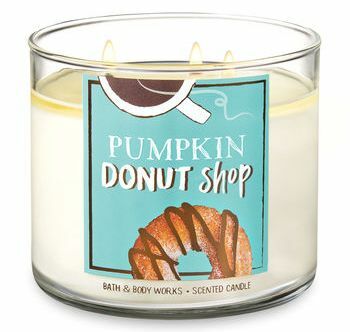 Pumpkin Donut Shop from Bath & Body Works is a scent you’ll want to purchase if you love the aroma of warm fried bread. If however you’re after a Pumpkin donut with clear pumpkin notes, I suggest you go to a Bath & Body Works store and smell this candle prior to purchasing it. To me, this fragrance had very little pumpkin notes to it. I still enjoyed it but then I’m a bakery girl… what can I say? I just wish the aroma would have been a tad stronger. Other than that… yum! Don’t see this candle online? Try a Bath & Body Works store which tends to carry all their current fragrances vs online.